Recently I wanted to create a Centos 7 Virtual machine on my Macbook Air (OS El Capitain – 10.11.3), as usual I downloaded an Iso from the net (The minimal Centos 7 Iso Installation). And as I will want to access my Virtual machine from other computers I wanted to bridge the network. But I don’t know why I can’t retrieve an IP address from my DHCP Server, so I defined a static IP Address and the network worked fine. 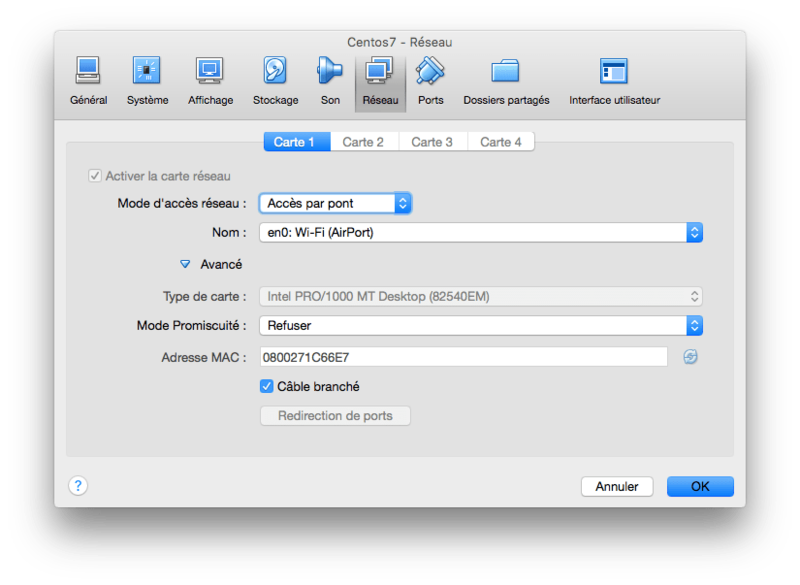 First in the configuration of the virtual machine on VirtualBox, I attached a network card bridged on the Wi-Fi (en0: Wi-Fi (Airport)). The name enp0s3 is what we are looking for. Be sure to have the ONBOOT option set to yes for starting the network on virtual machine boot. The IP address of the gateway depends on your network configuration. Or reboot your virtual machine. And Test ping pinging some ip (192.168.1.1 / 8.8.8.8)/ domain names : (www.google.com). And now you can access to your virtual machine. I don’t know why i can’t obtain an IP address from my DHCP using bridged networking on Wi-Fi, but the Static IP is a satisfying workaround for me.